Our comfortable Hunting Lodge is located on top of the hill overlooking our lake, open meadows of grazing wild game, and the hills of the Missouri Ozarks. Glass the fields and edges of timber throughout the day to see the big game animals moving throughout the property. Start the morning with a hot cup of coffee on the front porch and ready yourself for the morning hunt with the sounds of Elk bugles, screaming Sika, and an amazing variety of wildlife. Cost is $150 per night including meals or $100 per night without meals. 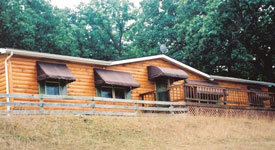 Hunters 2 nights of lodging & 6 meals are included in the package price. For more information on Big Game Hunts OR Summer Vacations, please call (314) 209-9800 or fill out our contact form.